In building a lot of LEGO Architecture models and sorting through 50 pounds of used LEGO bricks, I learned that a well organized brick collection is a requirement. I agree with most LEGO builders that the best way to sort a large LEGO collection is by part, rather than by color. After a lot of research, I decided to buy several Akro-Mils bins in a mix of 24, 44, and 64 drawer configurations, and I planned to create labels for each drawer! Beautifully designed LEGO labels which print perfectly on a Label Printer. I created scripts to produce sharp, high contrast images with thick outlines that will print well on a Label Printer. The labels which I designed use these crisp images, the common name for each part, and the Part ID#. Some of the labels from this collection. Each file contains a strip of about 10 labels organized into categories, so you should print only the labels you need. These labels are designed to be printed using a Brother Label printer (such as the PT-P700) on Brother 1/2″ Laminated Tape. These labels are waterproof, smudgeproof, durable, and they come in a variety of colors such as White, Pink, Yellow, Clear, and even Gold. The first version of these labels only included parts for the excellent 1210 piece 21050 – LEGO Architecture Studio set. I’ve expanded the collection to include many of the parts which weren’t included in the set but should have been. I’ve since added labels for many Technic parts, and will continue to create new labels in the future. September 17, 2014 Added a table of compatible Brother label printers at the bottom of this article. September 13, 2014: Version 1.4 improves consistency and quality of text + images throughout the “All Labels” collection. This version also adds 8 new panel types, technic_pin_axle_connectors, and technic_misc labels. September 10, 2014: Version 1.3 adds many of the most common Technic parts including: Pins, Axles, Technic Bricks, Ball + Socket, Technic Plates + Rotors, Connectors. Gears, Pulleys and other specialty parts will need to wait for another day. May 30, 2014: Version 1.2 of this collection now includes most of the labels for a large general-purpose LEGO collection. Let me know if you like it by leaving a comment. Missing some important parts, let me know. In my next update, I hope to add common Technics pieces. Have these labels helped you get organized? Let me know you like them by leaving a comment below! Michael, thanks for the kind words. I hope the labels help you get your bricks more organized – I know they helped me tremendously. As for additional instructions, I do have one available already, and may make others available int he coming months. (They are very time consuming to create) Visit http://brickarchitect.com/book/extras/ to download instructions for a tiny neoclassical monument. Hey Tom, I love your labels, they will be very useful. I saw on one of your versions where you said you included scripts so that people could make their own labels using LDraw. I found the script files in the 1.8 download but I am curious, how does one go about doing that? You do a great job but I know you don’t have a ton of time to devote to making more labels all the time, so I was curious how to do that. Wonderful work! Just started organizing our Lego out of giant tubs into Stack-On and this was perfect. Are there any labels set up for modified plates? Thanks again! Tom it was great seeing you at BrickCon, your workshop was awesome. Picked up the book as well. I was wondering how easy it would be to make labels for the entire LDraw catalog. Your labels are so awesome and honestly would be happy to donate to help “pay” for your time to create labels for the whole catalog. I don’t know if that is a ridiculously huge request or not, but figured I would at least as. If not is there a walkthrough for your script to do it myself? Thanks again for the workshop and the book. Really enjoying it. Thanks for the label. Really changed the way I sort and store my legos. Quick question, Is there a way to tell the P-Touch Editor to automaticaly cut the labels between each pictures? I am a professional organizer and I am obsessed with the labels! How can I share a link to this on FB? Thanks in advance. Thanks Patsy, I’m glad you like them! Just copy the following link (to the latest version of the labels) and paste it on your facebook feed. Facebook should do the rest! I was wondering if you have made or could make these labels available in a PDF file so that they could be printed on a standard sheet of paper. I like to make my labels a little bit different from the printed tape but your labels are exactly how I want this to look. Thanks much for your posts, I’ve learned enough to start my new after school club, “LEGO Architect”. My question is how many distinct pieces are in the LEGO Architect Studio set? For instance, if our club starts with 4 to 8 sets how many Akro Mills Drawers would be required? You can fit about two complete “LEGO Architecture Studio” sets in one of the Akro-mils drawer cabinets, but you need 2 cabinets to have enough drawers to fit all of the different parts. You will also find that the most common parts will run out, whereas the specialty parts like the sloped roof sections are rarely used. My suggestion would be to build as many LEGO workstations as you can to allow more students to work at the same time: Each station might contain two copies of Architecture studio set plus some extra common elements (ordered via bricklink), organized into one 24-drawer cabinet for the more common elements, and one 64-drawer cabinet for the smaller, specialty parts. I would love to discuss further, as this is a really neat idea! Any tips are greatly appreciated! Harrison, I have not had a lot of problems with dust. It isn’t a tight seal, but it seems to keep dust from settling on my bricks. I also try to keep the LEGO room relatively clean to keep dust from becoming a major issue. P.S. I keep a can of compressed air in my LEGO area. If something is a little dusty, I blast it! I have been organizing my 7 yr old son’s massive LEGO collection and am so glad I started on the right track! 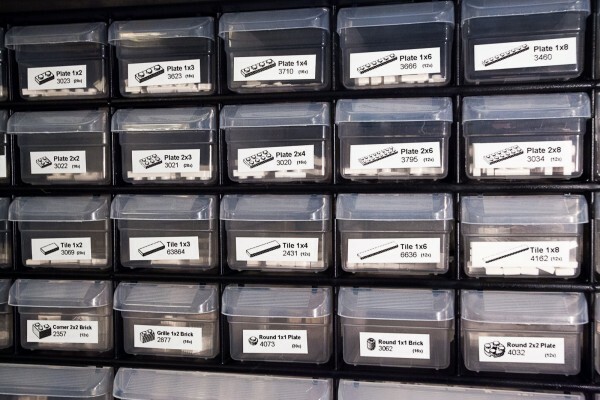 I started off by sorting by brick size and more detailed sorting with the smaller pieces using the Ackro – mils brand drawers. I am excited to get to the next step – labeling. I stumbled across your page this morning and am even more excited to complete this project! I can’t wait until my son’s LEGO station is complete. I have noticed a huge difference in the way that he is able to create and play with his LEGOs organized vs. dumped in a bin. Plus, it helps keep me sane! Thank you so much for sharing all of your hard work with the labels! I really appreciate it! Sharon, I’m glad to hear that organizing the bricks has made it easier for your child to build models, and for you to feel like everything is in it’s place. It seems like you got lucky, too, as some kids seem to really enjoy dumping everything on the floor, and others seem to like a well organized collection. The Amazon link for the Brother PC Connectable Label Maker (PT-P700) states that there’s a newer version of this model. It’s wireless, but I don’t know if that’s the only difference. Do you know if the newer version, Brother Printer PTP750W Wireless Label Maker, will work as well as the PT-700? I like the idea of being wireless so i can move around, but only if the wireless model (PTP750W) works as well or better than the PT-700. thank you so much for all your help and information! I do not have the newer wireless model, but I have heard that it works great with my labels. You will still need your computer to print the labels, so I’m not sure the wireless capability will be all that much more convenient. Let me know if you do get the wireless model, as i’d love to know if it’s more convenient for you! Good luck, and happy organizing! Thank you! After researching and reading reviews, I decided upon the PT-D600. (I did start through one of your links to Amazon.) It’s not wireless, but it has a nice keyboard and can be used both with the computer and as a stand-alone labeler. The prices on some of these labelers have been fluctuating a few dollars the past few days, but the PT-D600 costs about the same as the PT-700 at the moment. I played with it today and it’s lovely, though I immediately went back on Amazon and ordered a much longer A-male to B-male USB cable so I’ll have some maneuverability. I will try your label files (including the new ones!) as soon as I have a bit more time and report back. Next up is to decide on which/how many Akro-Mils cabinets. Hi Tom! I am going to buy a printer (from your link) to print these labels. How much tape do I need to print them? The printer comes with 16′ but I’m not sure if I should buy more. Thank you so much for sharing these! Just noticed though, and i’m not sure if you ever fixed it, but in your photo, you have the Plate 2×6 and Plate 2×8 label examples swapped (example 2×8 is in 2×6 label and vice versa). Awesome site, look forward to continuing to explore.